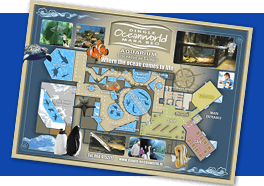 Welcome to the Dingle Oceanworld Otter Exhibition! These otters are the smallest of the 13 species of otter worldwide. Otter- like animals have inhabited the earth for the last 30 million years and over the years they have undergone subtle changes to their carnivore bodies to adapt to the diverse aquatic environment. In comparison humans have only been around for the past 2.5 million years! 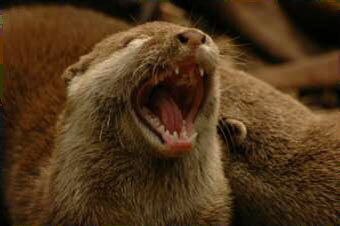 This species of otter are highly sociable and diurnal (most active at during the day). They rely heavily on their sense of smell and they are very territorial, they use their faeces (called spraints) and musk from their scent glands to mark their territory. Although these are highly intelligent animals and are highly adaptable, unfortunately many of the Otter species are endangered. 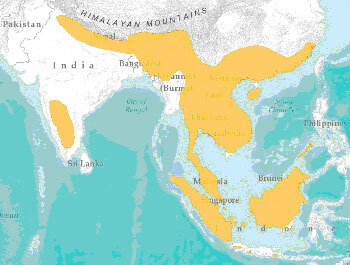 Asian small-clawed otters are threatened by rapid habitat destruction and pollution. They also may be sold as pets in some countries, considered pests by rice farmers, trained by fishermen to drive fish into nets, or hunted for their pelts, meat and organs for medicine. Found in coastal mangrove swamps, marshes, freshwater wetlands, and rice paddies throughout Southeast Asia, southern China, Indonesia, and the Philippines. Playing with stones! This is a really important part of otter practice and to improve dexterity. 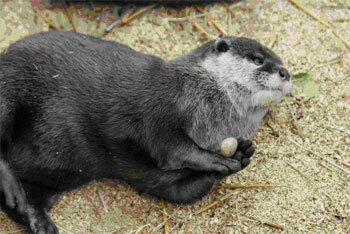 These otters have very nimble paws and use them to open their prey such as shellfish. The alpha female is boss! These otters are highly sociable and often live in groups. However there is always an alpha pair and within the group these are the only individuals allowed to breed, with the group and alpha male responding to the alpha female and often bringing her food. Babysitting! 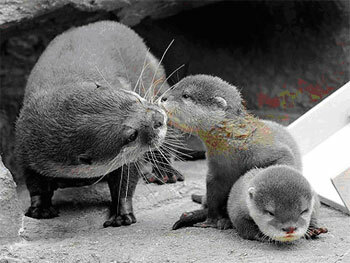 These otters are very much a family group with the previous offspring staying to help rear the next litter of otters. These otters can breed twice a year with a gestation period of 60 days, the pups are unable to swim until about 3 months old! 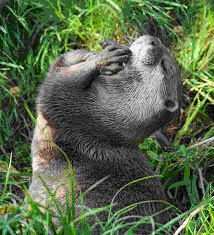 Preening: To keep their fur in tip top condition otters spend a lot of their time preening. This helps keep their fur waterproof and ensures proper insulation. As their name suggests these otters have short but very flexible, sensitive claws, useful for digging, climbing and also for grabbing and holding on to prey. When underwater they can close their nostrils and ears! Enrichment is our way here in Dingle to ensure we are able to stimulate this very intelligent species. We also can use enrichment to help us monitor their health; such as by teaching them to open their mouths so that we can keep any eye on plaque build-up on their teeth. One of the best methods for training otters is to use the “Clicker” training method. This is a positive reinforcement style of training whereby the otter is rewarded when they conduct the desired behaviour. The same method is used with many other animals such as horses and sealions. Their numbers are going down and they are now listed as one of the world’s most Vulnerable species. That’s why it’s so important to support conservation projects to safeguard the future of this important species. You can also help raise awareness by spreading the word. Tell your friends and family! You can also support the local work for the European Otters by reporting sightings, protecting their habitat and protecting their food supply! And of course you can help in all areas by simple steps such as Reduce, reuse and recycle and turning off that light switch! 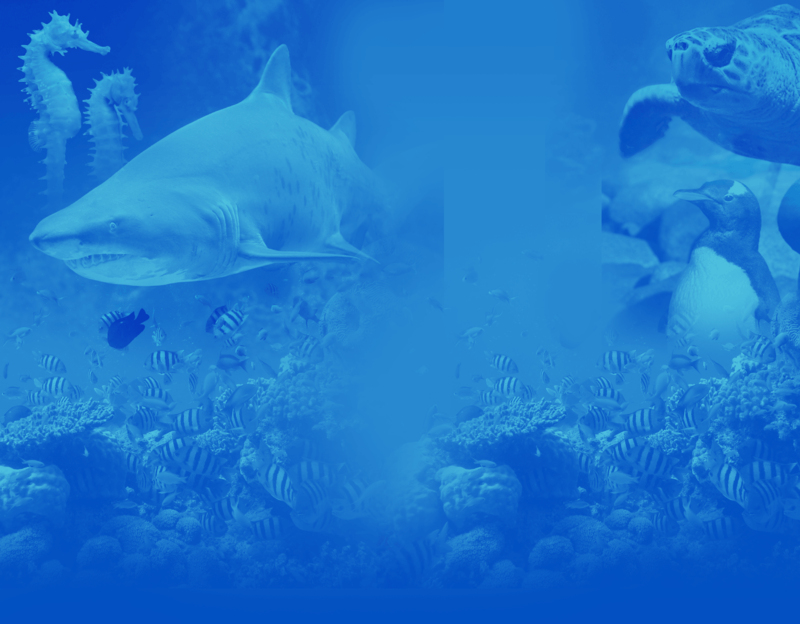 They build burrows along water banks with entrances as deep as three meters underwater! Wild Diet: Crabs, mussels, crayfish, snails, fish, frogs, insects, bird eggs, rodents, snakes, worms and small aquatic mammals. They have 34 teeth, humans only have 32! They have a high metabolic rate and need to eat 20% of their body weight a day!